An alkesh enters Earth's atmosphere on a heading for Cheyenne Mountain. F-16s engage the craft, bringing it down, and at the crash site SG-1 encounters its only occupant - Ba'al. Held in custody at the SGC, Ba'al confides his intentions. His clones have turned against him, and now he seeks SG-1's cooperation to eliminate them. In return, he offers his assistance. 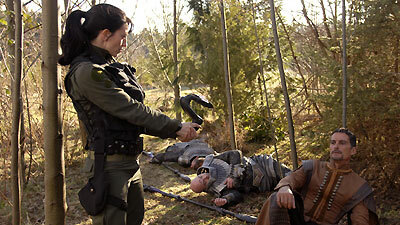 Merlin's weapon, he insists, will be found on a planet among those retrieved from the Ancient database, and only with his help will SG-1 be able to narrow their search. Suspicious of Ba'al's motives and his information, SG-1 agrees to capture the clones for the intelligence they might provide. SG teams use the locator beacons implanted in each Ba'al clone to track and apprehend them. Nearly 20 clones are captured, but each clone prisoner insists that he is the real Ba'al. What's more, they refuse to cooperate under interrogation. Meanwhile, Agent Barrett of the NID arrives at the SGC with authorization for the transfer of prisoners to NID custody for questioning. His request is denied, and as his patience wears thin, he becomes uncharacteristically outraged and demands to see one of the prisoners. However, Ba'al overpowers Barrett and escapes, releasing the other clones. As containment is lost, Landry orders the base under lockdown. As the SGC prepares to release symbiote poison, Ba'al captures Carter and orders her to download the Ancient database. To spare the hostages, Carter cooperates, but as the poison is released, it is already too late. The clones retreat and congregate, where the combined signal of their locator beacons overrides the base's jamming technology, and they are beamed away to a waiting ship. It had been Ba'al's plan all along, and Barrett's participation had been guaranteed through Goa'uld mind control. The clones are once again at large, with knowledge that could lead them to a weapon capable of destroying not only the Ori, but the Ancients themselves. Search parties were sent to the coordinates of Castiana and Sahal. Castiana has a toxic atmosphere, and Sahal has evidence of stone structures apparently abandoned over 40,000 years ago. So far the search seems to be a dead end. Daniel has returned to Camelot to look for more clues in Merlin's archive. According to Ba'al, Anubis knew of Merlin's weapon and its power and had told Ba'al about it. He had dedicated considerable effort to finding it during his time in our plane of existence, but never succeeded. The address for the location of Merlin's weapon is among those O'Neill obtained from the Ancient repository of knowledge. Barrett and the NID have been investigating the Goa'uld infiltration of the Trust for two years, considering it a global conspiracy with political and corporate connections in over a dozen countries and Ba'al at the top of the pyramid. Qetesh had once attacked Ba'al's fleet at Selenis, crippling his flagship and killing 10,000 of his best Jaffa. After the stargate was stolen two years ago, the SGC installed jamming devices to prevent anyone from locking on to a signal within the base. The trip through the stargate takes 3.2 seconds. Ba'al's cargo ship is equipped with Asgard beaming technology.